Ocala, Florida -- The Hybrid Halter® combines the best of all worlds… the safety of a leather halter, the leverage of a stud chain, the gentle precision of a soft rope nose and the training innovation of a built-in lungeing caveson. The end result is a handsome leather halter that fits in the most elite of competitive settings, while offering convenience, control and lightness in hand that no other halter can match. The design has been granted an official patent by the U.S. Patent and Trademark Office, which protects the creations of inventors. Young horse developer Kalley Krickeberg invented the Hybrid Halter® in concert with The Horse Education Company after becoming frustrated by the way existing flat and rope halters on the market limited the horse’s training response, safety and even proper self-carriage. “The biggest training advantage of the Hybrid Halter® is you have the opportunity to apply pressure more clearly and precisely than either a strap or rope halter – which allows the horse to travel more properly on the ground, with better control and less resistance. It changes the angles of leverage you can apply and in terms of control, it’s a game changer. 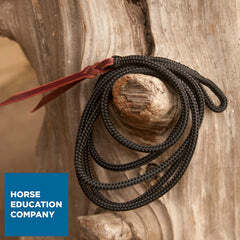 Because it has a rope nose with precisely placed pressure points, it discourages a horse leaning on it and because of its leather construction, it doesn't shift like a rope halter would and is safe to cross tie or trailer in,” says Krickeberg. 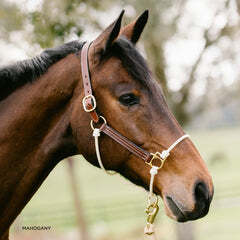 “The response to the Hybrid continues to be overwhelmingly positive and the leather versions make it a superior training option to a traditional leather halter for discriminating buyers who rely on a leather halter but may not have the lightness on the ground that they want,” says Horse Education Company President, Sara Johnson. The leather styles of the Hybrid Halter® are available in either black triple stitched leather with black yachting braid rope or oiled mahogany leather with a contrasting sand yachting braid rope. 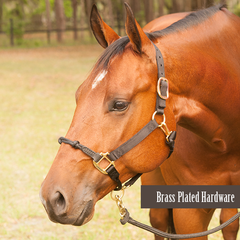 They offer the same convenience of brass plate personalization any other leather halter would, but with effective, kind and clear training leverage no other leather halter can offer. The cheek pieces through the crown piece is consistent to the traditional flat halter. 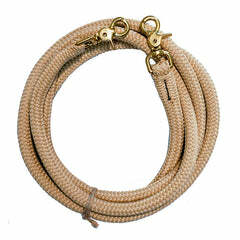 The nose/chin piece, jowl piece and connection piece are made of high quality soft yachting braid, like a traditional rope halter. 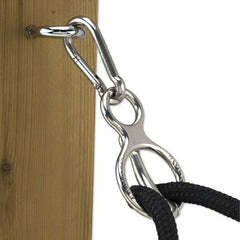 The yacht rope of the Hybrid Halter®’s nosepiece has nose knots to encourage lightness, while a sliding ring under the chin allows the halter ring and the snap of a rope or lunge line to slide a full 180 degrees, giving the handler the leverage one would expect with a snaffle bit in the horse’s mouth. “The magic of the Hybrid Halter® is at the intersection between the slide ring, stability and the diameter of the yachting rope, which all increase the leverage on the nose. 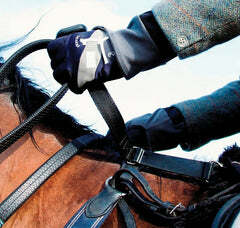 When leading or doing groundwork, horses virtually always push into pressure with their nose. 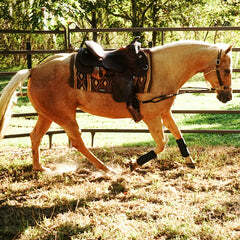 By changing that simple dynamic in a way that is clear and comfortable to the horse, we see an improved response. As with anything, a clear request makes a clear response possible,” says Krickeberg. 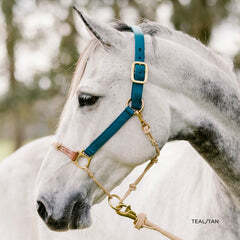 Variations of the halter are available in nylon webbing, leather and a range of nosebands that offer varying degrees of control bespoke for each horse’s circumstance. 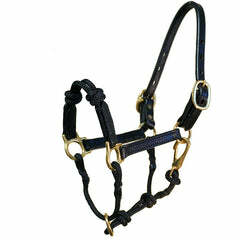 For more or to buy the HYBRID Halter®, visit www.horseeducation.com or call The Horse Education Company at 630-608-0804. 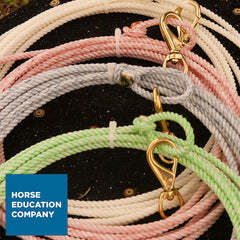 Founded in 2013, The Horse Education Company brings innovative, professional grade tools, educational products and gear into the hands of at-home trainers of all disciplines in the US, UK and Australia. 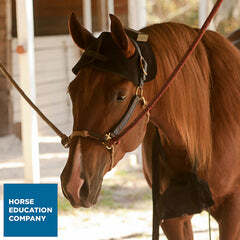 Their “better mousetrap” designs focus on keeping the equine athlete and at-home trainer happy, healthy and wise. 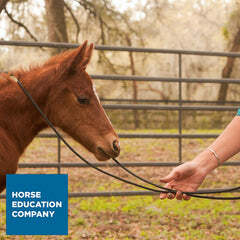 The company’s patented HYBRID Halter® gives the control of a stud chain with a horse friendly design that avid sport trainers and natural horsemen alike can agree upon, while the company’s line of lightweight ground and ergonomic training tools make it easier to get refined training results with less stress on the horse owner’s mind, time and body. 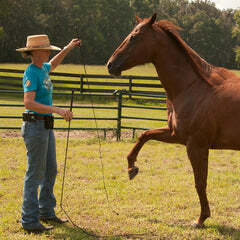 Partnering with leading trainers, competitors and clinicians the company offers the at-home trainer a curated selection of educational titles that allow them to maintain their horse’s mind and body with out-of-the-box challenges that keep the training relationship between horse and rider fresh, willing and consistently expanding. 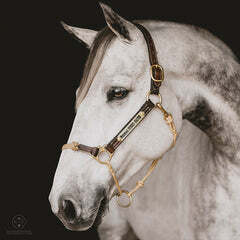 What size horse halter do I choose for my Arabian?